Each year, the European Researchers’ Night, a popular science event, is organized in several French and European cities. 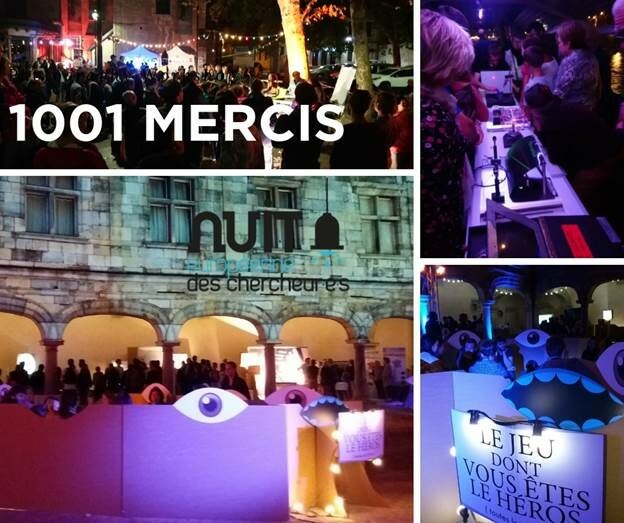 2018 hosted the 14th edition, under the theme “1001 stories”. On September 28, the University of Franche-Comté organized its European Researchers’ Night in Besançon, which was an opportunity for 2,550 visitors to discover science stories proposed by the Franche-Comté’s laboratories and also to discover SSUCHY project, presented at the event. Sharing “science in the making”: what are the questions, the procedures, the alliances, the successes and the difficulties? Interactive presentations and special atmospheres have been be created in order to facilitate the encounter between the public and the researchers. The idea was to provide immersion into the researchers’ world and highlight its attractiveness. This was a variation on speed-dating where members of the general public met researchers instead of bachelors. Every 8 minutes, the public switched to another researcher. The public entered a totally black room. A researcher talked about his/her work, without being seen, for 20 minutes. The intimacy created by the darkness was favourable to straightforward exchanges. A playful narrative concept in which the public was the hero. Visitors discovered and connected with a research story and faced certain choices they had to make. These choices influenced the unfolding and the end of the story. Research workers brought together with storytellers and actors. It is among this rich program that SSUCHY project has been presented in a fun way to an amateur audience.